For thermographers who must travel between job locations, finding an AC power source for recharging batteries or powering small devices can be a challenge. In some cases, a portable power inverter can provide a solution. Power inverters are electrical devices that convert DC power from a battery into conventional AC power. Designed to work in most automobiles, portable power inverters can provide AC power for charging portable batteries or operating small AC devices. Recent advances in technology have resulted in power inverters that are both small and dependable. With prices starting at less than $50, portable power inverters have become surprisingly affordable. Price is largely dependent upon two key specifications: wattage rating and sine wave output. Inverters can produce enough heat to start a fire. Never overload an inverter or leave it unattended. Lastly, inverters are capable of producing dangerous or lethal voltages. Never use an inverter in a wet location as electrocution may result. Apple Macintosh computers have long been noted for their superior graphics capabilities. 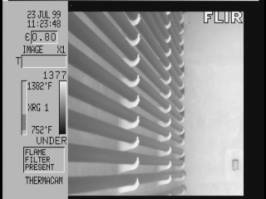 Although the Mac platform has been largely ignored by infrared camera manufacturers, Apple computers can provide thermographers with some powerful tools for documenting their findings. Since post processing software first appeared for thermal imagers, manufacturers have relied exclusively on PC based software for their applications. For some thermal imagers, qualitative imagery can be viewed using a Mac. However, at present, no imaging radiometer stores temperature data in a format that is readable by a Mac. Although this situation is unlikely to change in the near future, Mac computers do offer some distinct advantages for documenting an infrared inspection. For infrared cameras equipped with a standard video output, infrared imagery can be digitally recorded using a video recorder. Apple’s iLife suite can then be used to import and edit infrared and/or daylight video to produce professional quality videos or DVDs of an inspection. Video recordings are WYSIWYG; be certain that captured imagery contains exactly what you want a viewer to see – color palettes, temperature tools, etc. Generating standards-compliant reports and video recordings are two of the many topics covered in the Infraspection Institute Certified Infrared Thermographer® Level I training course. For more information on Infraspection training courses or class schedules, call 609-239-4788 or visit us online at: www.infraspection.com. Temperature limits and trending of two of the many topics covered in the Level II Infraspection Institute Certified Infrared Thermographer® training course. For more information on upcoming classes or to obtain a copy of our Cross Technologies Study, call 609-239-4788 or visit us online at www.infraspection.com. Images and Reports – Who Owns Them? It is said that, “Possession is nine tenths of the law. When it comes to infrared data, ownership is often not that simple. In this Tip we explore the frequently misunderstood topic of infrared data ownership. 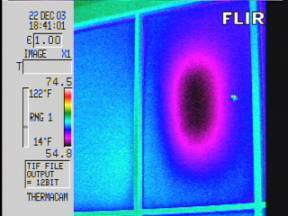 Thermograms and hardcopy reports are commonly produced for infrared inspections. Like proud parents sharing photographs of children, thermographers frequently share images, data, and reports with others. During these demonstrations, it is not uncommon to hear thermographers refer to this work product as “my images” and “my reports”. For the purposes of casual conversation, referring to work product in the possessive sense is acceptable; however, the actual owner of such data is often someone else. Under a principle known as ‘Shop Rule’, data produced by thermographers as part of their duties as an employee belongs to their employer. In general, Shop Rule will always apply unless there is a written agreement to the contrary. For thermographers who work as consultants, a principle known as ‘Works for Hire’ may apply. Under this principle, any work product generated belongs to the client and not the thermographer. Thermographers who work as consultants should be mindful that contracts and written agreements often have ‘Works for Hire’ clauses. These clauses may appear in the body of a contract or purchase order or be incorporated by reference. Thermographers who wish to retain ownership should address this issue prior to the commencement of any work. Prior to using infrared data for any purpose other than its original intent, always obtain permission to do so. Employers and clients are frequently willing to grant permission to use imagery provided it does not divulge a trade secret or jeopardize confidential information. Capturing imagery and preparing reports are two of the many topics covered in the Level I Infraspection Institute Certified Infrared Thermographer® training course. For more information on upcoming classes, call 609-239-4788 or visit us online at www.infraspection.com. Verifying infrared equipment calibration is one of the many topics covered in Infraspection Institute Level II Certified Infrared Thermographer training course. For more on information on thermographer training and certification or to register for a course, visit us online at www.infraspection.com or call us at 609-239-4788. Accurate confirmation of thermal data is a critical step when performing infrared inspections of energized electrical systems. In this Tip we discuss an advanced verification technique known as a voltage drop measurement. 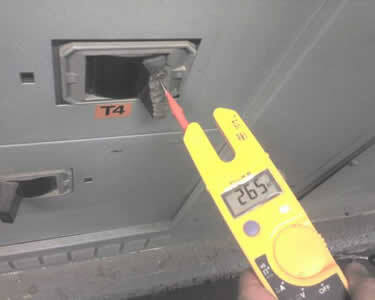 Loose and deteriorated connections are among the most common defects detected during thermographic inspections of electrical systems. Thermal patterns associated with these defects are characterized by heating at, or adjacent to, mechanical connections within the circuit. Loose connections are frequently found at terminals, lugs, fuse clips and splices. In most cases, thermographers discovering suspected loose connections will document such hotspots and recommend that the observed exception be investigated and appropriate corrective action be performed. Typically, such investigation is performed at a later time with the circuit de-energized utilizing manual inspection or contact resistance testing. Another method for confirming loose/deteriorated connections is known as a voltage drop measurement. To perform this test, a digital voltmeter is used to measure voltage across the subject connection with the circuit energized and under load. Loose/deteriorated connections will exhibit an increased voltage drop across the connection due to higher resistance. Observed voltage drop values may then be compared to other similar connections under similar load. Because voltage drop measurements require contact with energized circuits, this testing should only be performed by qualified persons while observing all necessary safety precautions. Lastly, one should be aware that neither temperature nor voltage drop measurements can predict time of failure for any electrical component. Therefore, suspected loose connections should always be investigated for cause and appropriate corrective action undertaken as soon as possible. Infrared inspection of electrical distribution systems is one of the many applications covered in the Infraspection Institute Level I Certified Infrared Thermographer® training course. For course schedules or to obtain a copy of the Guideline for Performing Infrared Inspections of Electrical and Mechanical Systems, visit Infraspection Institute online at www.infraspection.com or call us at 609-239-4788. Infrared inspections of flat roofs is one of the many applications covered in the Infraspection Institute Level I Certified Infrared Thermographer® training course. For course schedules or to obtain a copy of the Guideline for Performing Infrared Inspections of Building Envelopes and Insulated Roofs, visit Infraspection Institute online or call us at 609-239-4788. Infrared inspection of flat roofs and proper equipment selection are two of the many topics covered in the Infraspection Institute Level I Certified Infrared Thermographer® training course. For more information or to register for a course, visit Infraspection Institute online or call us at 609-239-4788. 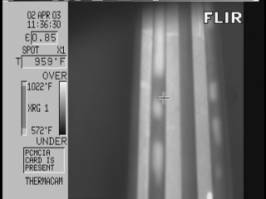 Thermography is a proven technique for inspecting insulated, low-slope roofing systems. Under the proper conditions, thermography may also be used to inspect uninsulated roofs that are constructed with an insulating deck. Flat or low slope roofs, also known as insulated roofs, are a common feature found in commercial construction. Applicable construction includes smooth, gravel, or granule-surfaced membranes having a layer of insulation located between the deck and the membrane and in continuous contact with the underside of the membrane. As an alternative, some roof membranes may be installed without insulation directly over insulating roof decks. Common insulating deck materials include gypsum and lightweight concrete. Typically, these materials are mixed to produce a liquid slurry which is poured and formed in place during construction. After solidifying and drying sufficiently, the roof membrane is laid directly over the insulating deck. 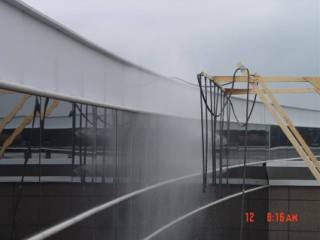 Because wet-applied decks can retain significant quantities of construction water, thermographically inspecting these roofs can be a challenge. In some cases, it may take several months for construction water to dry out making it difficult or impossible to detect thermal patterns associated with water ingress. In other cases, water entering these systems due to a leak may diffuse or dry out quickly. Infrared inspections should be conducted by walking over the subject roof(s) after sunset. The inspection should be methodically conducted and no inexplicable anomaly should be overlooked. All thermal data should be verified by invasive moisture meter readings and core samples. Core samples should be gravimetrically analyzed to ascertain that moisture content is acceptable even if the roof appears to be uniformly dry. 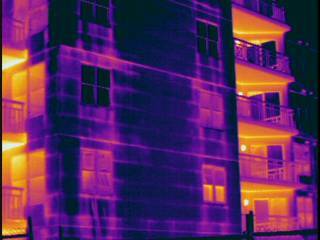 Infrared inspection of building envelopes is one of the many topics covered in the Infraspection Institute Level I Certified Infrared Thermographer® training course. For more information or to register for a course, visit Infraspection Institute online or call us at 609-239-4788. Many thermographers are aware of the OSHA and NFPA standards requiring the use of Fire Resistant Clothing. Aside from proper use, care and maintenance are of utmost importance for maintaining the effectiveness of FRC. Fire Resistant Clothing is required Personal Protective Equipment for many who work in high temperature areas or near energized electrical equipment. If your job requires the use of FRC, there are several important things of which you should be aware. FRC is not fireproof. It is designed to protect the wearer from burns by resisting ignition during brief periods of high temperature exposure such as electrical arc flashes. FRC effectiveness can be compromised by age, wear, contamination with flammable materials and the attachment of name patches or embroidery. FRC can be rendered ineffective by improper cleaning or laundering. FRC should be laundered separately from other garments and in accordance with manufacturer’s recommendations and the requirements of ASTM Standard F1449. FRC should always be worn as the outer-most garment. If worn over other layers of clothing, the undergarments should be made of natural fiber and completely covered by the FRC. Before wearing FRC, be certain to understand its proper application and limitations and how to use and maintain it properly. Thermographer safety and the use of PPE are two of the many topics covered in the Infraspection Institute Level I Certified Infrared Thermographer® training course. For more information or to register for a course, visit Infraspection Institute online or call us at 609-239-4788. Infrared inspections performed in commercial and industrial settings may require entry into confined spaces in order to inspect equipment. In this Tip, we cover the basics for working safely in confined spaces. According to OSHA, “A confined space has limited openings for entry or exit, is large enough for entering and working, and is not designed for continuous worker occupancy. Confined spaces include underground vaults, tanks, storage bins, manholes, pits, silos, underground utility vaults and pipelines. Thermographer safety is one of the many topics covered in the Infraspection Institute Level I Certified Infrared Thermographer® training course. For more information including course locations and dates, visit Infraspection Institute or call us at 609-239-4788. For more complete information on workplace safety, visit the OSHA website. Although thermography is a non-contact test, preparing for an infrared inspection of electrical equipment often requires manual preparation of switchgear components. Unwary thermographers and their assistants can be injured by making contact with cabinets or component surfaces that have become accidentally or unintentionally energized. Switchgear enclosures and components are generally designed to prevent their surfaces from becoming energized. Under certain circumstances, switchgear enclosures and other dielectric surfaces can become unintentionally energized to significant voltage levels. This potentially lethal condition may be caused by improper wiring, faulty equipment, or contamination due to dirt or moisture. The image below shows a potential of 265 volts AC between a molded case circuit breaker and ground. This condition was discovered after an unprotected worker received a shock by touching the phenolic breaker handle. There are no old, bold thermographers.